For over three decades, Oxtotitlan cave, in the state of Guerrero, Mexico, has been noted for its late Middle Preclassic period (c. 800-500 BC) paintings, many of which show strong similarities to the art of the Olmec of Veracruz and Tabasco. The Oxtotitlan paintings were investigated by Dr. David Grove in 1968 and 1969. Prof. Héctor León of Chilapa and the villagers of Acatlan provided valuable information and assistance to that study. 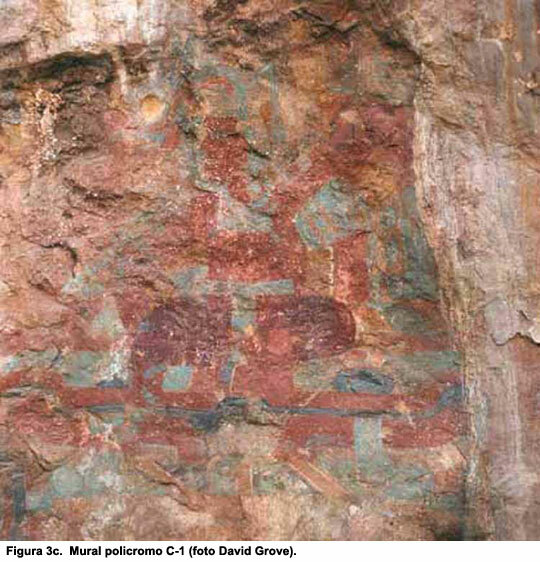 Dr. Grove described the paintings in detail in several publications in Spanish and English ("Murales Olmecas en Guerrero", INAH Boletin 34:11-14, México; Los Murales de la Cueva de Oxtotitlán, Acatlán, Guerrero, Serie Investigaciones No. 23. INAH, México ; "Olmec Cave Paintings: Discovery from Guerrero, Mexico," Science 164:421-423 ; The Olmec Paintings of Oxtotitlan Cave, Guerrero, Mexico, Studies in Pre-Columbian Art and Archaeology No. 6. Dumbarton Oaks, Washington, D.C. ). The photographs posted on this web site were taken by Dr. Grove in 1968 and 1969, and show the state of preservation of the paintings at that time. Oxtotitlan cave is located on a hillside approximately 1 km. east of the village of Acatlan, and about 8 kms. north of the city of Chilapa, Guerrero. The cave consists of two wide grottos at the base of a broad cliff face. The paintings occur in three areas: the North Grotto, the South Grotto, and the cliff face in the area between the two grottos (the Central Group). The North Grotto paintings (#1a,b,c,d,e, 2-9) are generally small and executed in a black pigment on the dark grey limestone walls of the cave, a fact that makes some of them difficult to see clearly (for example, paintings #4 and #6). In contrast, the paintings of the South Grotto (Group A, A1, B2) are generally executed in red paint and are primarily simple geometric designs. 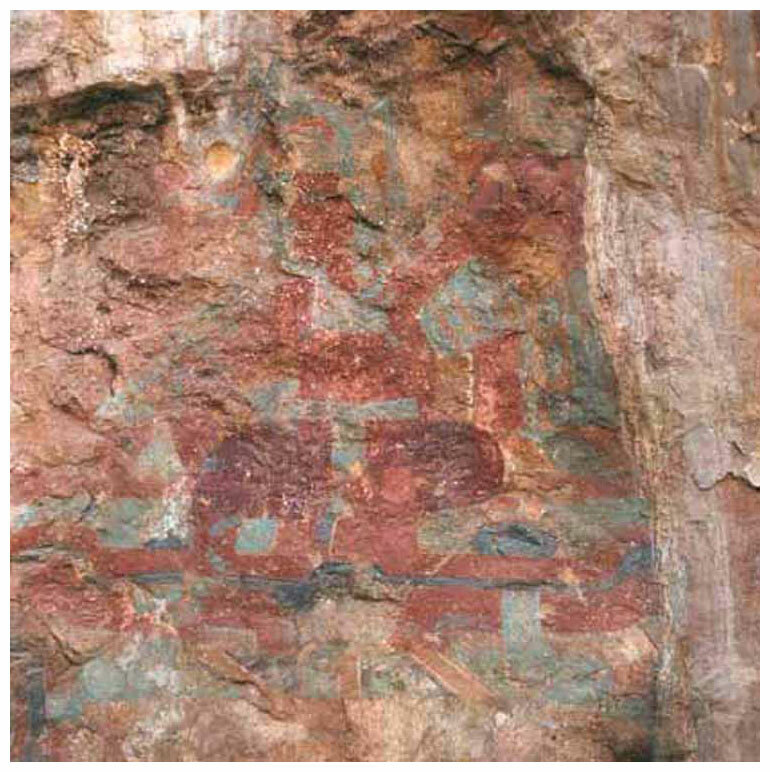 The Central Group is comprised on two large polychrome murals (C1, C2) executed on the cliff face. In 1969, several textile fragments said to have been found in the cave were photographed by Dr. Grove. Numerous people visit Oxtotitlan every year. Unfortunately, some of the visitors have been careless and have abused the cave and the paintings by leaving trash and graffiti. By the year 2000 the cave and paintings were in poor condition. However, in 2002 Sandra Cruz (Restauradora Perito, Coordinación Nacional de Conservación del Patrimonio Cultural, INAH- Churubusco), began a successful multi-year project of conservation of the cave's paintings. The graffiti and damage caused by past visitors has been eliminated and many of the paintings have been carefully cleaned and preserved. In addition, the villagers of Acatlan have assumed the important role of care-takers and guardians of the cave and its paintings. Visitors are still welcome, but the cave is now protected by a large fence with locked gates, and people wishing to visit the cave must first register at Acatlan's municipal palace in order to gain access. 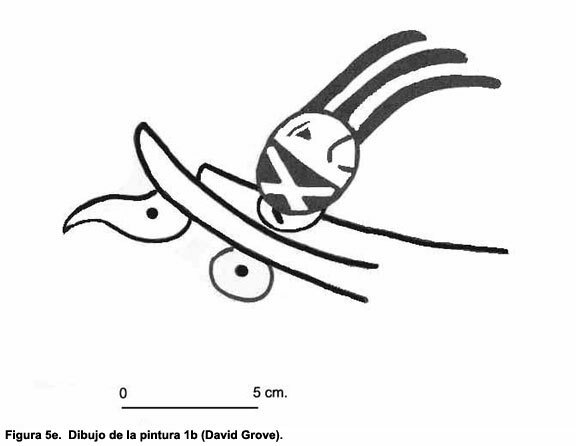 For information on archaeological research carried out in 2003 and 2004 in the area of Oxtotitlan cave by Dr. Paul Schmidt (UNAM) see: (2003) Surface Archaeology in the Chilapa-Zitlala Area of Guerrero, México, (2004) Surface Archaeology in the Chilapa-Zitlala Area of Guerrero, México.